Come out and have dinner with the ladies from Job’s Daughters International for this Bethel fundraiser! Come join us to celebrate the day everyone is Irish (Except the WM)! Come out and enjoy some fellowship and listen to St Columba’s band Eastward!! This is a BYOB and pot luck party so let’s show off those Irish recipes! We will be supplying the corned beef brisket and cabbage, just bring the Irish sides. This is a family event so bring the kids. This is open to masons and non-masons so all are welcome. Please RSVP so we can have enough corned beef. Dinner starts at 6:30pm - Being served is Pasta alla Vodka with Bacon, garlic bread, and chicken noodle soup. There will be a version without Bacon and vodka for those who prefer it that way. Meeting begins at 7:30pm - Discussion will be Scottish Rite. We will be conferring the EA Degree this evening. Dinner begins at 6:30pm and the gavel drops at 7:30pm. We will be reading Article XVI of the Grand Lodge Constitution with our Grand Inspector. 6:30pm - Holiday Dinner / potluck with the families and at 7:30pm we will be Passing Brother Smith and Bro Smith to the 2nd degree. Also, we will be having a dirty santa gift swap ($20 wrapped gift). Hopefully, Santa will show up for the little ones during dinner as usual. It's good to know that ole St Nick is a Master Mason (He is a traveling man). Come out and support these three Brothers as they get raised to the sublime degree of Master Mason! 6:30pm Dinner with Communications to begin at 7:30pm. This is lodge elections night! 6:30pm - Potluck Thanksgiving Dinner and at 7:30pm we will be conferring the EA Degree on during this meeting. Join the entire state of Maryland as we install a new Grand Master and his officer line for 2018 - 2020. Our own WM Reggie Eda will be installed! 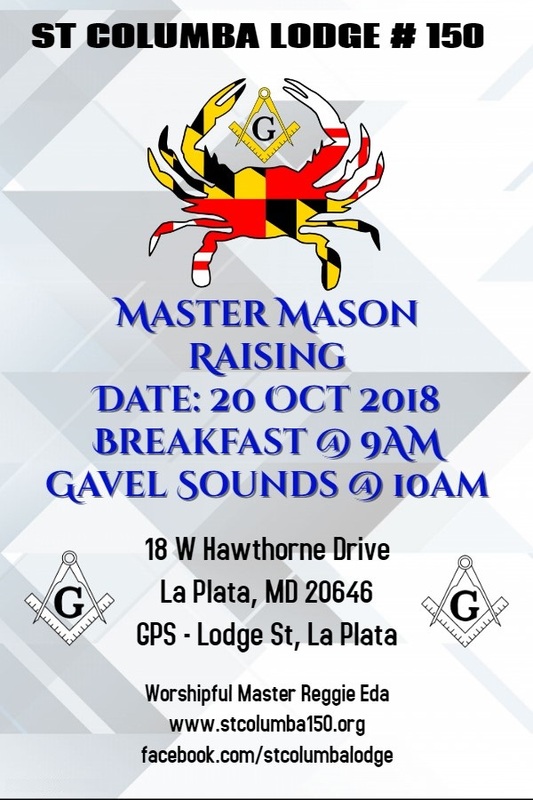 This is our yearly visit to the Maryland Masonic Homes and all Officers are required to attend and we highly recommend all Brothers attend this event to support the residents of Bonnie Blink. Afterwards, we will have dinner together before heading back to SOMD. Dinner begins at 6:30pm with our regular meeting to follow at 7:30pm. The Most Worshipful Grand Master of Maryland Mason's, Kostas Vourvoulas will be attending the Job's Daughters meeting and all Mason's of St Columba Lodge at requested to be at this event to support the youth group. This will be one of the last events that GM Vourvoulas will be attending as the outgoing GM so let's give him a great send off and show him how strong St Columba is today. Harvest Home day - Grand Lodge of Maryland A.F. & A.M.
Open to all male friends and relatives. We will be raising a Brother to the sublie degree of MM this evening. All Masons are welcome to attend. We will be rehearsing for our June 5th meeting when we initiate 3 new Masons.